Upon using common usernames your site might be sensitive brute-force hacking methods. Essentially, these methods try to log in with various combinations of usernames and passwords. 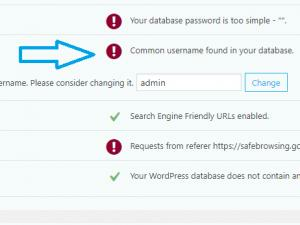 Using a username such as "admin" for example, will increase the chances of such algorithms to be successful. Among the most the common usernames, "Root" was the top username guess by dictionary scripts—attempted 12 times more often than the second-place "admin." Successful root access would open an entire computer or server to a hacker, while admin would grant access to somewhat lesser administrative privileges. Other top usernames in hacker scripts were "test", "guest", "info", "adm", "mysql", "user", "administrator" and "oracle". All should be avoided as usernames.